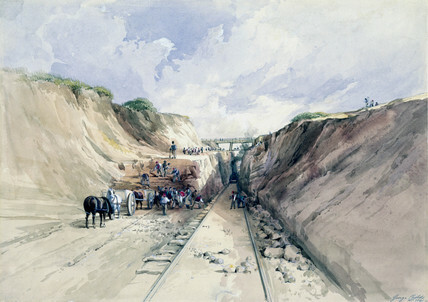 Watercolour by George Childs, showing a view of a railway cutting, posibly on the Great Western Railway (GWR) line between Bath, Somerset, and Bristol. Isambard Kingdom Brunel (1806-1859) was appointed chief engineer of the GWR in March 1833, with the task of building a railway to link London and Bristol. The first section, opened in 1838, went from London to Taplow, Buckinghamshire, and the line finally reached Bristol in 1841. The GWR was the first to install an electric telegraph alongside its lines.